In their Australian home, wild budgies feed on the seeds and grains of different grasses. Many other popular pet bird species love to eat half-ripe seeds. 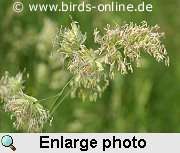 In case you want to offer your birds a natural daily diet, is recommended to feed them Orchard grass (Dactylis glomerata) which is very common in Central Europe. The plants reach a height of up to 120 cm (approx. 3-4 ft). This makes Orchard grass	easy to find in nature, it grows on meadows and even in parks and gardens. It flowers from May to June, ripe seeds can be found from June to August. My budgies prefer flowering orchard grass or panicles with ripe seeds. Ripe seeds are available as an additional bird food in some shops. All photos and the text on this page are protected by the copyright law. In case you'd like to use photos or texts for your own non-commercial purpose,	please contact the author.